The core of the President’s Management Agenda, published in March 2018, is that the federal government must transform the way it operates with a modern, forward-thinking approach that provides superior services to citizens and uses taxpayer dollars much more judiciously. The Agenda outlines three key areas the administration will address to turn the government into a citizen-centric entity: modern IT; data, accountability, and transparency; and the workforce for the 21st century. While on a certain level these are independent initiatives, intelligent automation – which collectively refers to digital technologies including Robotic Process Automation (RPA), machine learning, and artificial intelligence – is a solution that intersects all three. These digital technologies are already delivering a wide range of benefits to the organizations that embrace them: cost savings; greater productivity and performance; enhanced customer satisfaction; more agile and efficient processes; scalability; accuracy and reliability; reduced operational risk; and superior data management, auditability, and usage capabilities, to name just a handful. True enterprise-grade RPA (not to be confused with Robotic Desktop Automation, or RDA) maps ideally to the Agenda’s focus on the workforce for the 21st century. It allows organizations to do more, with less staff, for less money, while simultaneously freeing up human employees’ time from tedious, repetitive tasks to focus on higher-value work requiring emotional intelligence, reasoning, judgment, and direct constituent interaction. As the needs of organizations in both the private and public sector continue to evolve, so must the capabilities of RPA software robots to enable more advanced forms of intelligent automation and drive innovation. So, we’ve identified six essential skills that “intelligent digital workers” must possess in order to work and collaborate in lockstep with their human colleagues. Knowledge and Insight: This gives digital workers the ability to harvest information from different data sources, understand it, and deliver valuable insights from it. Using pre-built integrations with AI platforms such as those from AWS, Google, IBM and Microsoft, these digital workers can identify trends and patterns in text communications to isolate issues, and seamlessly turn those communications into action items that can be assigned to the right person or system. Planning and Sequencing: This skill allows digital workers to apply the same logic to workflows as their human counterparts, while exchanging information securely using all legacy and modern digital channels. It enables software robots to optimize workloads and discover opportunities that yield better outcomes. Visual Perception: This enables digital workers to digitally “read,” understand, and contextualize visual information, and work within any application screen in the same way as humans. Integrations with leading AI platforms allow these software robots to use machine learning-enabled computer vision, engage in image perception, and understand image data and documents. Collaboration: This skill gives digital workers the ability to communicate and collaborate with human co-workers, systems, and other software robots across modern digital channels, thus supporting complete end-to-end automation of business processes. Learning: This allows digital workers to adapt to evolving process patterns and gather contextual meaning, and thus new insights, from data sets. Problem Solving: This skill enables software robots to solve logic, business and system problems without human intervention. These skills are Blue Prism’s vision for a truly intelligent digital workforce capable of working hand-in-hand with human employees to deliver tangible results against increasingly demanding expectations. Through our partnerships with the world’s foremost cognitive computing and AI technology companies, we’re rapidly evolving the capabilities and intelligence of our software robots so they can apply their multiple skills to any functional area of an organization. And because it’s a commercial off-the- shelf solution, organizations have the ability to integrate it into their processes leveraging the intelligent automation platform of their choice, rather than being tied to a particular platform that may not stand the test of time. We believe these intelligent digital worker skills represent a triple win for the government: they will enable the 21st century workforce vision set out in the Agenda to be realized, enhance job satisfaction among government employees, and make citizens happier with the services they receive from the government. 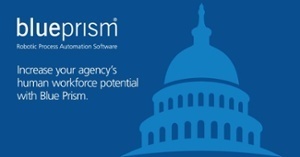 For more information on how Blue Prism is enabling government agencies to digitally transform visit: https://www.blueprism.com/gov.